If you have any questions check the contact/F.A.Q. page on my website or ask them in the comments below. Recipes and more information can be found in the Camping Cookbook. Coloured campfires? BWAHAAHAH, thats awesome, now I can make blue sausages. it isn't finished. i need help with the particles, to make them colored. 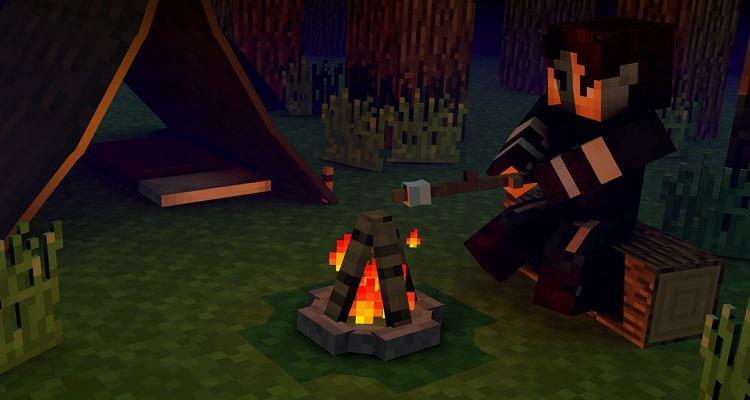 Seems Like an awesome mod, maybe you should try adding Tents so its like a camping mod. Seems nice. But first, fix the spelling. I am very sorry for that, but i am dyslexic. If it has anything to do with photoshop, I can help. It doesn't but thanks anyway. I just don't know how i can add new particles to the game. I have plan's fot that, but now I am trying to add new particles. I now know how to add new particles. all the particles i made become green, black, or blue with a black outline, does anyone know how to make them white/orange/enz..
added a preview picture of a green campfire next to an normal one. but the particles are still not colored. If you are an modder and know how to add them pleas let me know. Maybe they find the stick to torches too cheap? You will have my feedback once I get to try the mod! Is it alright if I'm going to do a mod spotlight about this mod? that makes me happy to, but no one seems to know how adding particles. i usually get a white box. if someone know how please tell me!! Okay so I had time to upload it today so I did. Am I allowed to post the link to the video here? yes you are but i already placed it under reviews. Just did a review of this mod, you can use it in your post if you like it. Message me when you have new updates/features and I'll add them to the video! Hmm, this mod seems nice! I have a question though, is this your first mod? If so, then congratz on a great first mod, if not, then, it's still very good! Keep it up! This is my signature. If you don't like it, then that's too bad.